Other mothers told me that having a daughter is very special, an experience that I didn’t want to miss. They kept telling me to “think pink” and hope for a girl. But I already had a little boy so I knew that boys are just as nice to have as little girls and that two little boys would do just fine. My “mother’s intuition” told me that the second baby would be another male and that their daddy would have two sons to follow him around and imitate his every move. I was wrong and I’m glad. On a beautiful, sunny Sunday afternoon, May 1 (1983), a beautiful little girl was born. 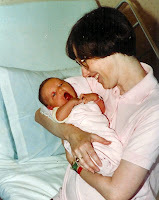 And from the first moment that I held her, a special bond was formed between mother and daughter. When she looks at me with her dark, round eyes, already so expressive, her dainty lips forming a little “ooh” I feel that we are already communicating in a special mother-daughter way. As I feed her, we have delightful chats about her future. We discuss whether she’ll wear her hair long or short and I tell her that she has a mother with absolutely no talent for fixing hair. We talk about clothes and I tell her how beautiful she’ll look in ruffles but that she can wear jeans for keeping up with her very active big brother. I tell her about the books she will enjoy when she gets a little older, books that her mother once enjoyed. I tell her about Heidi and Little Women and other classic tales. And there are some things that I tell Mary Catherine that are the same things that I told her big brother, Peter, as he and I sat together in his nursery two years before. I tell her that she must become the very best person she can; that she must discover her own personal talents, develop them and use them in the best way possible. Mary Catherine and I discuss her future, sitting together in her nursery. We discuss the facts of life of being female – how in her future perhaps people will give females more credit for the work they do. How, when she is helping run a business like her mommy does, that people will not give all the credit to the males. Yes, there really is a special bond between a mother and daughter. Just like there is a special bond between mother and son. Nothing can take away the special relationship between Peter and me. But another dimension has opened in my life. Whereas Peter looks to his Daddy to learn how to act as a man, Mary Catherine will look to me to learn how to act as a woman. It is an awesome responsibility being a role model. It’s almost as frightening as it is exciting and challenging. Already, I see Peter imitating his father in the way he stands and the phrases he chooses. Standing in the kitchen the other day, watching the two of them together in the back yard, I saw how eager Peter is to do what his dad does. As Allan scooped things up in his shovel and tossed them over the fence, Peter, a few paces behind, scooped things up in his little shovel and tried hard to toss them over the fence as well. Like father; like son; like mother; like daughter. Our little imitators are watching and so the challenge is ours, to be the best person we can, not perfect, but as good as we can be. It might be easier on a mother having two sons, but I think it will be more exciting and challenging having both a son and a daughter. Mary Catherine and I have only had a week together but the bond is already formed. 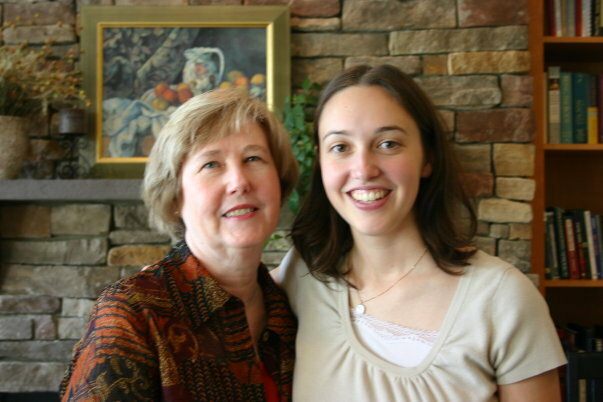 The other mothers were right – a daughter is very special indeed.